I have known about Max Cassidy ever since I was a teenager. 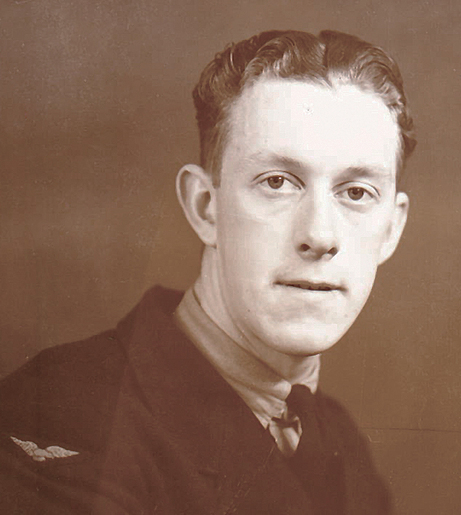 My mother June Light had a whirlwind romance with the cocky Royal Australian Air Force pilot from Launceston, Tasmania, who was completing his flight training in North Battleford, Saskatchewan before going overseas. They talked of getting married after the war, in the cautious manner of young lovers during those unpredictable years. Max was just nineteen years old when he died, and my mother was twenty. On December 4, 1944 they planned to go to the picture show. Instead, my mother got a phone call at her office – she was working at the local Wartime Prices and Trade Board - to say that Max’s aircraft had crashed near a small town called Delmas. A nearby farmer witnessed the accident. Max deployed his parachute, but he was too low to the ground, and died on impact. 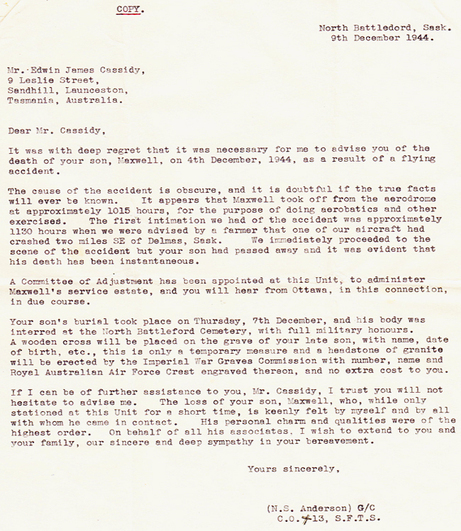 June attended Max’s funeral, and wrote to the Cassidy family expressing her condolences. 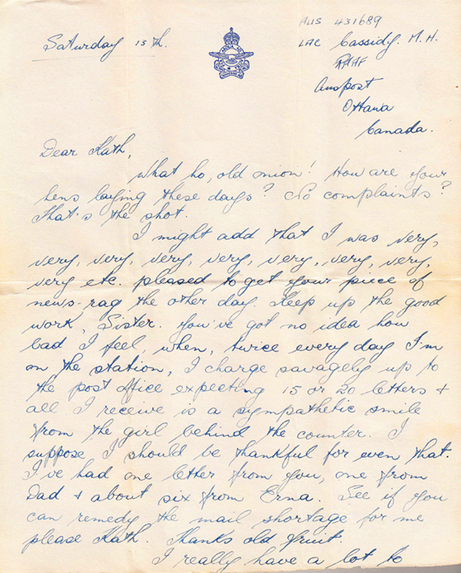 Janet sent me a copy of my mother’s long-ago letter, and I shed a few tears myself when I read it. Here’s a look at the first page, followed by the entire letter. I’m sure that you have probably never even heard of me but I wanted so much to write and tell you how much I thought of Max and how much I sympathize with you and the rest of the family in your loss. Max and I knew each other only a very short time, but in that time we got to know each other so well that it seems queer to realize that I only knew him for three weeks. I met him in the War Services Club in North Battleford where I was serving as a hostess, and from then until the time of his death we saw each other as often as possible. The news of his death was a terrible shock to me as he had left me the night before so happily and so full of life. He had a great number of friends here and was so well liked by all who know him. I was so amazed the first time I was out with him to find he knew more people at the dance than I did, and I’ve lived here all my life. We kept remarking how sorry we were that we hadn’t met each other sooner, but maybe it was better this way because the pain I feel now would have been so much the greater. Max was so fond of home and Tasmania. We heard what a lovely place it was so often and he brought over some pamphlets to show us. I’m sure it is a great compliment to his family to have him love his home so much. I don’t know anything about the crash as yet as none of the particulars have been released and I haven’t been talking to any of the boys from the same course long enough to find anything out. You probably will have heard from the Padre at the airport by this time and he would know. Canon Hives, the minister at our church here in Battleford, has asked for your address so that he might write too. He was very kind and took Mother, Jim, Colin (my two younger brothers) and me to the funeral in town and later to the cemetery. It may comfort you a little to know what a great many flowers he had and what a lovely funeral service there was. Max stayed in our home on Saturday night as he had a 36-hour pass, and so was able to come to church with us the next morning. We like to remember that he took Communion that day and we know that God will remember. There doesn’t seem to be much more I can say. Mother is writing to you and will give you details that I’ve missed. Mother knows herself what it is to lose a son, as my brother was killed in a plane crash some time ago. I wonder if you possibly have a picture or snap of Max that I could have as I have nothing of dear Max’s to treasure. Please take comfort in the thought that Max was among those who loved him and happy until the end. Five years after writing this letter, my mother married my father. But she kept her photo of Max in her album, and never forgot the pain of his loss. So how did Janet Mears of Australia find my mother? I saw the post, and contacted Janet. She was delighted to hear from me and even more flabbergasted when I told her that the former June Light (now June Florence) is now 89 years old and still living in her own house, near me in Invermere, British Columbia. Janet and I exchanged many emails. I interviewed my mother and sent the audiotape to Janet. She in turn sent me some lovely photos and other mementos that I showed to my mother, including one of Mum herself that was returned to Max’s parents along with his other belongings. 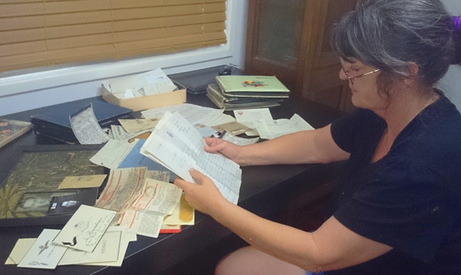 Here's a photo of Janet at her home in Australia, looking at Max's letters. Janet was happy to receive a copy of my mother’s own memoirs called Silver Linings, in which she writes about Max’s death. And she was touched when I told her that I had used the name Maxwell Cassidy for one of the characters in my upcoming novel, as a way of remembering the young man. Together we agreed that Max’s name should not be forgotten. So here, dear readers, are some poignant reminders of a bright young man whose life ended far too soon. Max was the youngest of five children born to Edwin and Mary Cassidy. Edwin was a labourer and railway worker. He served in the First World War and fought at Gallipoli with the Australian and New Zealand Army Corps (ANZAC). Like so many other Great War veterans, he was distressed at seeing his beloved son don another uniform, and leave for yet another bloody European war. Here is Max with his parents. 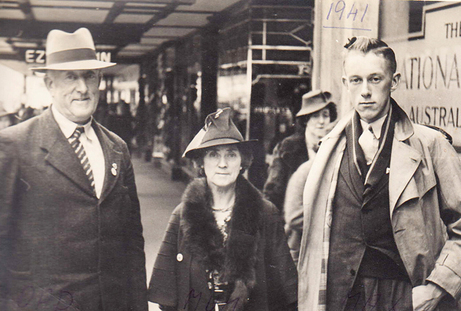 Max was particularly close to his older sister Kathleen, who was already married to her husband Leonard and had four children, when her brother left Tasmania (an island off the coast of Australia) for Canada’s far-off prairies to participate in the British Commonwealth Air Training Plan. 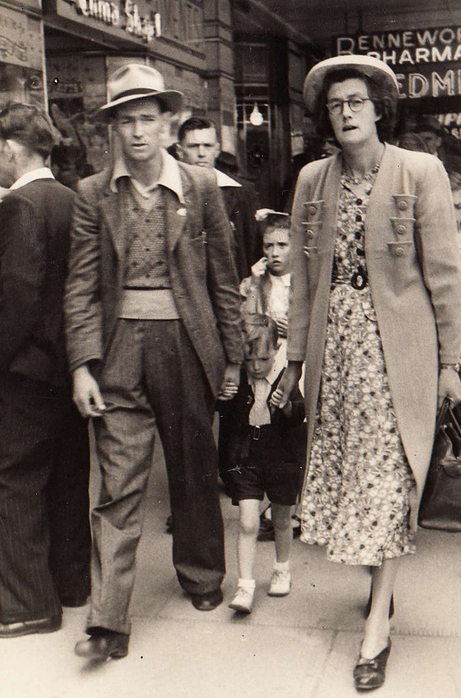 Here is a photo of Kathleen and Len taken after the war, with their youngest boy Darrell. Max was tall and lanky, with a comical expression, well-known for his wit and charm. 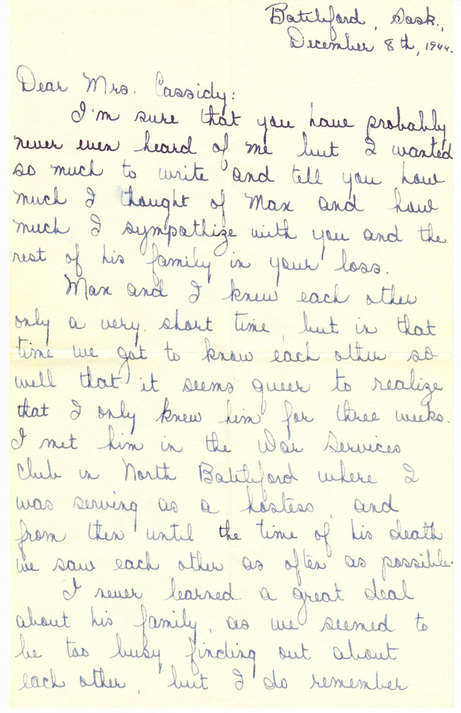 This letter from Max to his sister, written soon after he reached North Battleford and before he met my mother, certainly illustrates his way with words. It begins: “What ho, old onion! How are your hens laying these days?” It’s also amusing to read his observations on Canadians. Here’s a photo of the first page, followed by the entire letter. What ho, old onion! How are your hens laying these days? No complaints? That’s the shot. I might add that I was very, very, very, very, very, very, very, very, very etc. pleased to get your piece of news-rag the other day. Keep up the good work, Sister. You’ve got no idea how bad I feel, when, twice every day I’m on the station, I charge savagely up to the post office expecting 15 or 20 letters and all I receive is a sympathetic smile from the girl behind the counter. I suppose I should be thankful for even that. See if you can remedy the mail shortage for me please, Kath. Thanks, old fruit. I really have a lot to write about but I can never remember it when I pick up a pen. Naturally there is a good deal I can’t tell you. However, I’m sending home some photos of where I’ve been. I’ll tell you all about them when I come back. I’m now stationed at North Battleford in Saskatchewan. It’s only a small town – about the size of Burnie. The station is just average. It’s not as good as Edmonton. That was a super station. I don’t start flying until the 19th June. While we are waiting for the course to start, we are employed on general duties. I was working in the Airmen’s Mess last week. Had to set tables and dry cutlery, etc. Then I was put in the officers’ quarters as a batman. However, I never actually did any batting. We work twelve days and then get 48 hours leave. Last weekend I went back to Edmonton. It is about 225 miles by train. The nearest city to here is Saskatoon – about 95 miles away. I took on Edmonton as my home town in Canada. There are a lot of Aussies there. Am expecting to see some of the chaps I left at Western Junction next time I go there. My cobber, John McHugh from Melbourne, was made a bomber pilot and has gone away over east. I hope to meet up with him again in Montreal. They give us two weeks leave to go to New York when we graduate. That will be in about another six months. If I ever get my wings in these Kites (Harvards) I’ll be the happiest ANZAC in Canada. They are lovely looking planes, Kath. You’d like ‘em. I haven’t been up yet. Getting very impatient, too. They are similar to a Wirraway but look much neater. I’ve seen a good bit more of Canada than most Canucks. Travelled all the way up to Edmonton in the best compartments. Had first class sleepers. The trains certainly move over here. The one we came up in wasn’t one of the fastest, and it did 65 miles per hour most of the way. Came through the second longest tunnel in the world. About six miles long, I think. There is a longer one in Switzerland. One tunnel goes into the side of the mountain and winds about inside the mountain, and comes out about a thousand feet lower down. There is a picture of it in one of the books I’s sending you. The spiral tunnel it’s called. It’s in the Canadian Rockies. I’ve seen glaciers, frozen rivers, frozen waterfalls and whole forests covered with snow. Sure are wonderful sights. The weather at present is typically Tasmanian but in the winter the temperature gets down to about 40 or 50 degrees below. Everything is covered is snow. All the houses, trams, buses, trains and cars are heated. Nearly all the ground staff on this station are French. Canada has two languages – French and English. Some of them are hard to understand. There are a few RAF chaps here too. We have RAF, RAAF, RCAF and RNZAF all working together. I don’t think much of the bunch of Aussies that I’m with. They are a lot of drunkards. I’ve chummed up with a couple of “Chooms” from England. They are a decent bunch. Have been to a few dances but I don’t care for the Canadian style. Don’t think much of their music, either. I’m thinking of starting a school to teach Canucks to dance and speak English. They speak rather like the Americans. However, they have a much softer accent. They almost sing everything they say. I like to listen to the Canadian girls talk. They are rather pleasant to listen to. Guess I had better finish this off now, Kath. Give my love to the nippers. 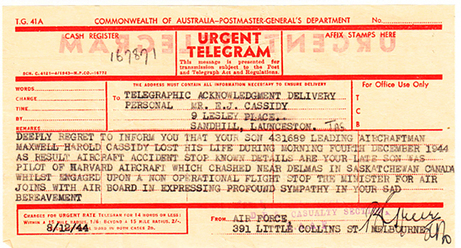 By the way, Kath, if Mum shifts from Leslie Place, tell her to be sure and notify the RAAF. It’s very important. She’ll be able to find out the particulars at the Recruit Centre, Launceston. Cheerio, my old tomato. See you later. 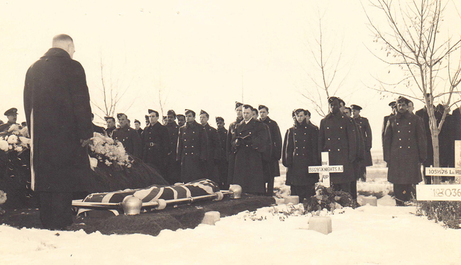 Max was given a full military funeral by the men serving at the RCAF Service Flight Training School 13. His comrades gave him a twenty-one gun salute. Less than six months later, the war ended. Max’s body is still buried at North Battleford, half a world away from the home and family he loved. One mystery remains. Some twenty years ago, Janet’s mother Elaine travelled from Australia to visit Max’s grave. Elaine was surprised and moved when she found fresh flowers on his grave. 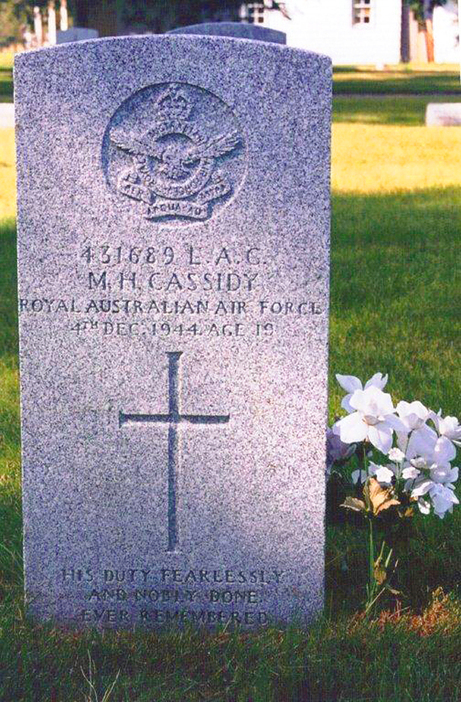 She wondered whether someone in North Battleford still remembered him, or was simply kind enough to honour the memory of a young Australian buried on foreign soil. Max’s parents Edwin and Mary Anne Cassidy had three other children, two boys and a girl. Max was the youngest of the four children, born in 1925 -- eleven years after his next youngest sibling. His eldest brother Edwin Keith, born in 1911, married Dorothy May Bradford and had three children: Helen, Elizabeth, and Julie. 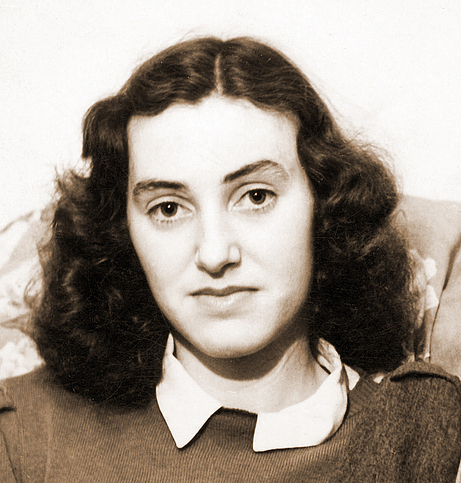 His only sister Kathleen, born in 1912, married Leonard Atkinson and had five children: Elaine (mother of Janet Mears), George, Lois, Rhonda, and Darrell. His brother Albert (Jack), born in 1914, married Gwenith Bradford and had four children: Valerie, Gwenith, Judith, and Maxwell John. By now the family has expanded to the third and fourth generations. Max left behind in Australia a warm and loving family who will never forget him. Rest in Peace, Maxwell Harold Cassidy. Max Cassidy's wonderful story, along with twenty-seven other original articles from Wartime Wednesdays, are now available in printed book form. 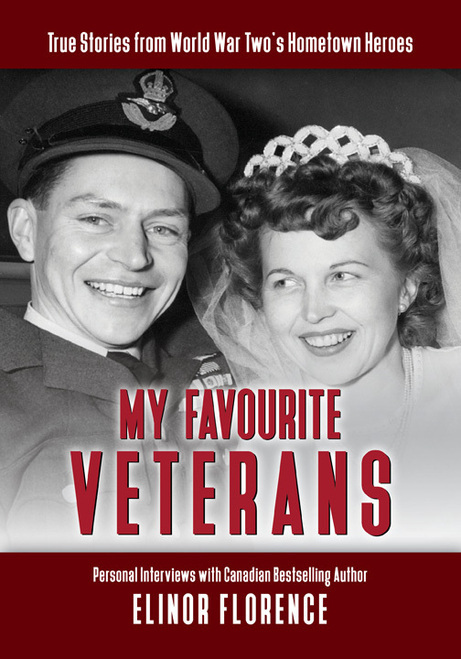 To read more about the book, click: My Favourite Veterans: True Stories From World War Two's Hometown Heroes. To order a signed copy for $35.00 Canadian, email me at elinor1@telus.net or call me at 250-342-1621.